ARMONK, N.Y.	- 08 Mar 2017: IBM (NYSE: IBM) today announced it has created the world’s smallest magnet using a single atom – and stored one bit of data on it. Currently, hard disk drives use about 100,000 atoms to store a single bit. The ability to read and write one bit on one atom creates new possibilities for developing significantly smaller and denser storage devices, that could someday, for example, enable storing the entire iTunes library of 35 million songs on a device the size of a credit card. Today’s breakthrough builds on 35 years of nanotechnology history at IBM, including the invention of the Nobel prize-winning scanning tunneling microscope. Earlier this week, IBM announced it will be building the world’s first commercial quantum computers for business and science. Future scanning tunneling microscope studies will investigate the potential of performing quantum information processing using individual magnetic atoms. By starting at the smallest unit of common matter, the atom, scientists demonstrated the reading and writing of a bit of information to the atom by using electrical current. They showed that two magnetic atoms could be written and read independently even when they were separated by just one nanometer – a distance that is only a millionth the width of a pin head. This tight spacing could eventually yield magnetic storage that is 1,000 times denser than today’s hard disk drives and solid state memory chips. Future applications of nanostructures built with control over the position of every atom could allow people and businesses to store 1,000 times more information in the same space, someday making data centers, computers and personal devices radically smaller and more powerful. The study was published today in the peer-reviewed journal, Nature. 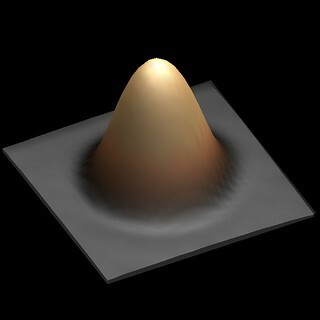 The IBM scientists used a scanning tunneling microscope (STM), an IBM invention that won the 1986 Nobel Prize for Physics, to build and measure isolated single-atom bits using the holmium atoms. The custom microscope operates in extreme vacuum conditions to eliminate interference by air molecules and other contamination. 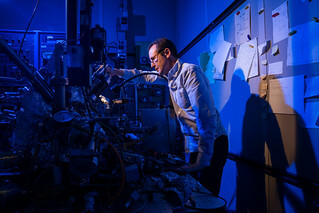 The microscope also uses liquid helium for cooling that allows the atoms to retain their magnetic orientations long enough to be written and read reliably.